"The debut mystery that kicked off the popular series about a live-wire girl detective, this Edgar Allan Poe Award-winning story takes place in Sammy's neighborhood -- right across the street from her grandmother's apartment, in fact.While looking out the window with her grandma's binoculars, Sammy witnesses a crime across the street at the Heavenly Hotel. What's worse, the thief saw her spying! As Sammy attempts to find the burglar who has made several other hits in the neighborhood, she finds herself trying to keep him from uncovering her -- or worse, the police discovering that she's living illegally with her grandmother in the seniors-only housing! 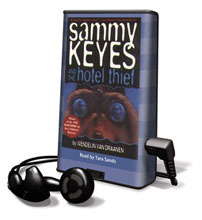 A modern-day Nancy Drew, the saucy, smart Sammy Keyes is a sleuth whose escapades entertain and inspire teens."